dehumidifier to the next level. 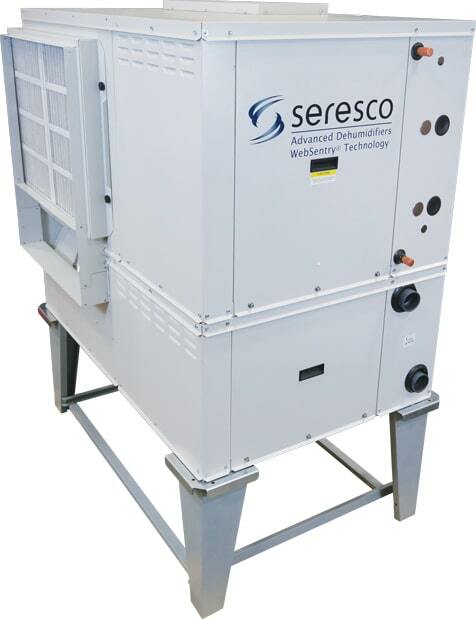 Our new NE Series dehumidifier launched Seresco to the forefront of the dehumidification industry. With this next generation product line we were determined to build not just an improved dehumidifier, but a dehumidifier that was better in every way possible – and we did! From the smallest details that others overlook to the most critical aspects of engineering and component selection, our new NE Series dehumidifiers truly set the industry standard for performance, reliability and value. Add to that, our revolutionary WebSentry Technology as a standard feature, and you’ve got 24-7 internet-monitored performance backed by an unrivaled two year parts and one year labor warranty (with WebSentry connected at start-up). For installations, requiring 10 to 100 lbs/hr of dehumidification and 650 to 8,000 CFM of air handling, our new NE Series provides features that beat the competition hands down – every time! Modulating reheat coil and pool water heating provides the ultimate in stable room conditions – a new industry benchmark! Industry leading Electrofin coated coils for total corrosion protection – not just the fins! Outdoor packaged system available as a standard product!